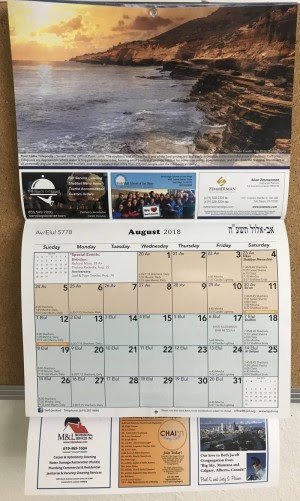 Beth Jacob Congregation is in the midst of designing our 5779 (2018-2019) 14-month color wall calendar that will be distributed to homes and businesses in San Diego and beyond. Place personal announcements such as your family occasions; i.e. birthdays, anniversaries and yahrzeits. Submit via email here or call us at 619.287.9890 (press 0). Make a donation in any amount toward the cost of production at www.bjsd.org/donate. The Center of Your Jewish Life!